What Day Of The Week Is September 25? 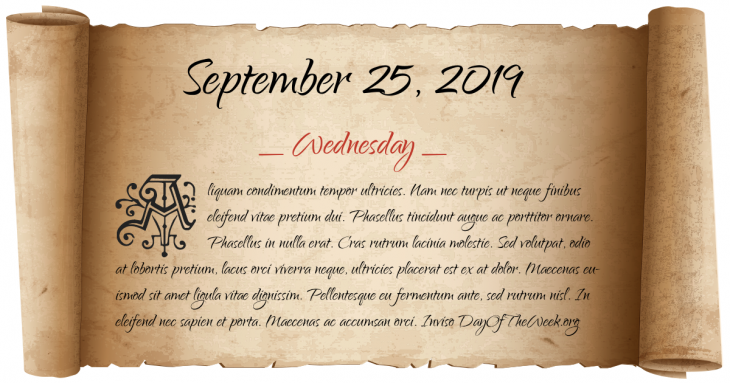 September 25, 2019 is the 268th day of the year 2019 in the Gregorian calendar. There are 97 days remaining until the end of the year. The day of the week is Wednesday. The U.S. Congress establishes Sequoia National Park. The People’s Democratic Republic of Algeria is formally proclaimed. Ferhat Abbas is elected President of the provisional government. Cease-fire between Jordan and the Fedayeen ends fighting triggered by four hijackings on September 6 and 9. Sandra Day O'Connor becomes the 102nd person sworn in as an Associate Justice of the Supreme Court of the United States and the first woman to hold the office. NASA launched a $511 million probe to Mars in the first U.S. mission to the planet in 17 years. Eleven months later, the probe would fail. China launches the spacecraft Shenzhou 7.
Who were born on September 25?